It is a daunting task for individuals who desire to get back to work after illness. It is not a draw back and one can make it an opportunity by shaping the break in the right manner. A positive attitude must be used to fetch a job either a new one or re-joining the previous one. There are many people who take off from work during sickness and return back to work successfully. A medical illness could be weeks, months or even longer. A clear track and right navigation towards job search would be apt. Getting a job after illness can be a great barrier, where a few hints mentioned below can be followed in order to gain a job as soon as possible. In an interview you must be prepared and explain the reason for your medical leave. You can mention that you required time to take care of yourself. It is advisable not to get in deep about the medical issue, instead you can bring out the fact that you have recovered and now eager to work. It is also suggested to be honest and state the truth as hiding health related problems can be illegal. Once you have swiftly explained your medical absence to the employer, switch your gears and start explaining about your strengths and your previous achievements. Open up your superior qualification and explain it how it matches the job. During your period of illness, you must have failed to adapt to the recent development and new emergencies. Illness may not have allowed to take classes and update yourself. But when you get a chance to update your skills make sure you do that. It is equally important for you to dedicate time for education and also hunt a job. Your energy levels for dedication and career search will be noticed by the employer. Getting a job after recovering from illness depends on the time period which you had taken a break. These people who desire to obtain a job are required to get associated and participate in the organizations, get associated with discussions, and more. They are suggested to read more of magazines and papers to know the openings available in their state. Attending seminars, one day lectures and courses can be beneficial at the time of interview. When you have recovered and decided to join back work, interview for a job is a must. Avert nervousness and answer your employer in an honest and a positive way. Instead of navigating into unnecessary details maintain and explain the true situation so that faith is developed by the employer on the candidate. To impress the employer, you can also add that you’re eager to work and completely recovered. Also make sure you avoid excusatory and inferior way of speech for medical gap. All these will portray you as the best addition to the concern. When you have started for the interview, make sure you look professional, lively and fresh enough. While at an interview, focus on future goals and also explain how your previous jobs can be beneficial to the current employer. It would be advantageous if you could research the company and position and get to know its goals and ideas. Also practice for expected questions and answers before attending an interview. Louise Shea, who is the vice president for human resources at the international rescue committee suggest candidates to avoid words such as ‘fully cured’. She also mentions not to get in detail about the medical situation. The candidates should answer and be prepared that they were just on hold due to sickness and not departed from work. This shows that the candidate is more concerned about the job and is still on the job track. There are many recruiters like Susan Egmont, who is a recruiter in Boston who is worried when her employees are ill, as they wouldn’t come back. To impress such employers, utilize the chance and mention in your cover letter that you have addressed the health issue during the break. She also mentions that more aspects can be explained during the interview. Be actual at the interview and assure the employer about your ability towards work. For one’s who had been very active and brisk before illness can get to new areas of job after a break. This can be a perfect opportunity where, you can match your skills and experiences and find out the various jobs available. Those you desire to take up a fewer physical role also can do so. Suppose you have worked in heavy industry and would like to take up less stress work, you can get to health and safety and quality management. After recovering from an illness, depending upon the line of work you’re choosing to make sure you’re updated in that field with the latest skill and knowledge. Your medical gap can have avoided you from learning the latest updates and developments. New working practices may also have popped in which you must be aware of and get acquainted. Reading the latest trade news and magazines and also getting associated with professional people can help you gain knowledge about what’s happening in the industry. Since your ill and away from work, you must have lost confidence during the period. Hence regaining confidence is mandatory in order to get a job after illness. Work plays a major role and helps in gaining self esteem and well being. When positive steps are taken and new ideas are followed confidence will be boosted and prepare you for a job after illness. Your type of injury and illness can be explained in an honest way to the employer so that they understand the reason for your break. It would be good if you get yourself involved in activities such as courses, volunteering, joining societies and so on. Apart from impressing the employers a positive image will also be built in this way. Just after illness, diving into a full time job can be burdensome to your body after a long break from illness. For the same purpose employees can seek for temporary jobs so that their mental and physical routine can be balanced. When you’re absent from work for a long time and need to regain or hunt for a fresh job, it would be advisable if you could seek the help of an adviser. 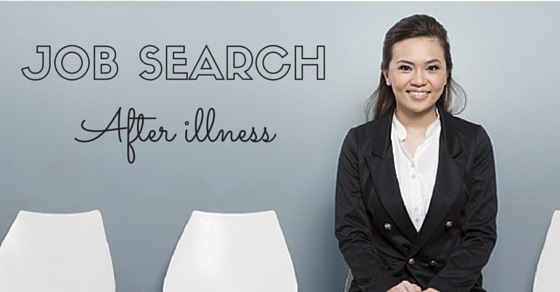 Either you decide to bring out your illness to the interview panel or an employer, or you wanted to fill up the gaps in the resume and make it fresh and neat an expert’s help is mandatory. An expert professional who can deal with such issues can be the right person who can deal with all these aspects. When you have decided to reveal your illness to the employer make sure you rehearse and practice well. Make brief explanation and positive statements about your illness and absence from work. Though recovering from illness can be a tough period, there are many examples with serious illness such as cancer, pancreatic disorder and more candidates who has taken initiatives and got back to their career after illness. The attitude to get back to work can be the only booster which fetches job for people who took a break. After your break from illness make sure you have your old colleagues in contact. You can also approach your other friends and ask for a job opportunity though its part-time. Part-time jobs can help you get many contacts within the organization and turn you into a full time worker. Run through the company’s intranet and local site to get more contacts. Networking is essential for any job seeker, especially when your back from illness after a break networking on LinkedIn, twitter, and other social networking sites can be beneficial. You can probe your contacts what they expect from, you know the industry and type of role available. You can enhance contacts related to your industry and ask help from those contacts based on your previous experience. Getting a job after illness can be a challenging life experience and so taking initial and the right steps forward can help you get the right job at the right time. Updating knowledge and developing skills by joining up courses can be helpful and gain you a job quickly. The right information, right knowledge and motivation are the key tools which would drive you towards work force. A positive approach and attitude are other aspects which enhances confidence levels within the employee and encourages to get him a job.